Are you planning a barbecue themed wedding reception or rehearsal dinner? You’ve come to the right place! Bootleg’s expert, friendly staff is happy to help you plan your event. Our catering specialists work with you to build a menu that includes exactly the items you want. Perhaps you would like to serve your guests some savory pulled pork, chopped chicken, or sliced beef brisket barbecue. Maybe you want to pair that with some of our crowd pleasing, home-style sides. You might even want to include some of our famous Hot & Sticky wings or slow-smoked ribs. Whatever the case, our catering specialist are ready to help you design a menu for your special day. Click the button to request a wedding estimate and let our catering specialist know the basic details for your event. One of our specialist will reach out to you to discuss an estimate. Click here for Bootleg's wedding gallery! Wondering about our service options? Bootleg doesn’t just make hearty, home-style meals. We deliver them too! We offer several on-site catering services. Depending on the size and style of your event, you may need simple delivery, an attendant, or a fully staffed buffet line. Our knowledgeable and experienced catering specialists will take the guess work out of planning your reception. 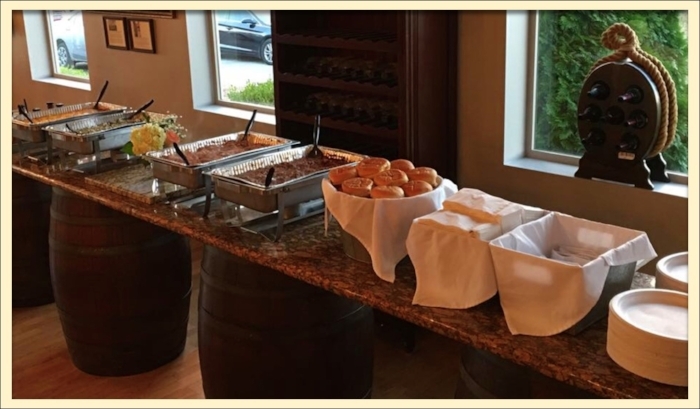 Bootleg’s catering specialist can help you decide which option you’ll need to make your reception a success. Whether you are hosting a reception for 50 guests or 500, Bootleg has you covered! If you’re ready to start planning your meal, please click the "Request Wedding Estimate" button above. Once our catering specialists have received your information, we can begin building your estimate and reach out to discuss your event in more detail. Still have questions? Please click the button below to go to our Wedding Catering FAQ page for more information or call our catering office at 502-239-2778. Click the button below to see frequently asked questions. Catering office business hours are 9:00 am to 4:00 pm Monday through Friday. Catering inquiries received outside of these hours will receive a response as soon as possible, when we return to the catering office.